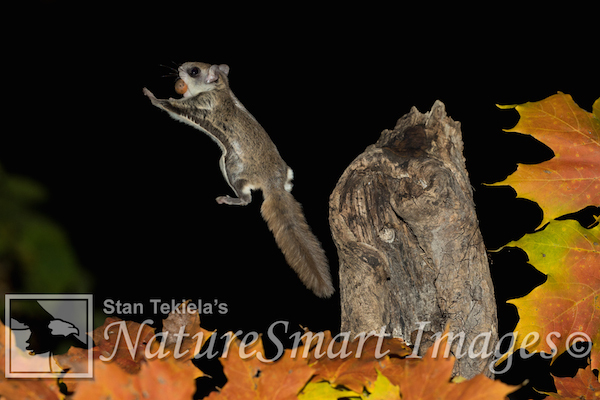 In today’s post, wildlife photographer Stan Tekiela shares with us his fascination with Southern Flying Squirrels. 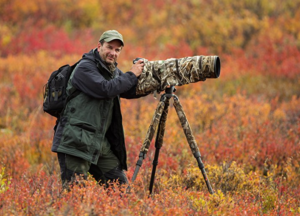 As a naturalist/biologist, I am interested in all aspects of nature. I am just as fascinated by the plants as I am with the insects. I am also thrilled by the birds and the furry critters too. But nothing has thrilled me as much lately as the adorable flying squirrels that live in my yard—in particular, Southern Flying Squirrels (Glaucomys volans). We actually have two species of flying squirrels in the U.S.: the Northern Flying Squirrel and the Southern Flying Squirrel. The northern flyer is located in the extreme northern states from Minnesota through New England and well into Canada. The southern flyer occupies the eastern half of the country from the Great Lakes to Florida and all points in between. The Southern Flying Squirrel is slightly smaller than the Northern. The southern flyers have white to cream bellies, while the northerns have gray. Other than that, they tend to look very similar. The Southern Flying Squirrels are small tree squirrels. Compared to the familiar Eastern Gray Squirrel that occupies nearly everyone’s backyard, the flyers are about one quarter of the size. Every time I invite someone over to see my flyers they remark about how small they are. Yes, they are very small, which I think makes them even more adorable. They have huge, dark, bulging eyes and tiny, furry ears. All of these attributes combine to make them look so cute. For the past six months or so, I have been actively studying my flyers about two to three nights per week. Some evenings I take photographs; on others, I just observe. Lately I have been making audio recordings of their sounds. Each night I look forward to seeing my flying friends go about their aerial business. At this time of year, the flyers are super busy gathering food and storing it for later consumption. They stash food in tree cavities for leaner times in winter when the going gets tough. Of course, these small, fuzzy squirrels can’t actually fly. They are expert gliders. They climb up high in a tree, scamper their way to the outer branches, and launch themselves off into the darkness. They spread their front and back legs to draw taut a flap of skin between the front and back legs called a patagium or gliding membrane. A long, thin piece of cartilage, called the styliform cartilage, extends from the wrist outward and acts to pull the skin tight. When this happens, the flyer’s body turns into a wing. Not only does the styliform pull the flap of skin tight, but it also turns the tip of the “wing” upwards, giving it a dihedral shape. Studies show that when a bird flies with its wings in a dihedral shape, if one wingtip is too high, then it provides more lift on the opposite wing and tips the bird back to the other side. This provides stability in flight. This is called the dihedral effect. The same thing happens with flying squirrels. When the styliform cartilage extends out from the wrist, it points the tip of the “wing” upward and provides stability in flight. You’ll notice a similar setup on the tips of the wings of large passenger airplanes. 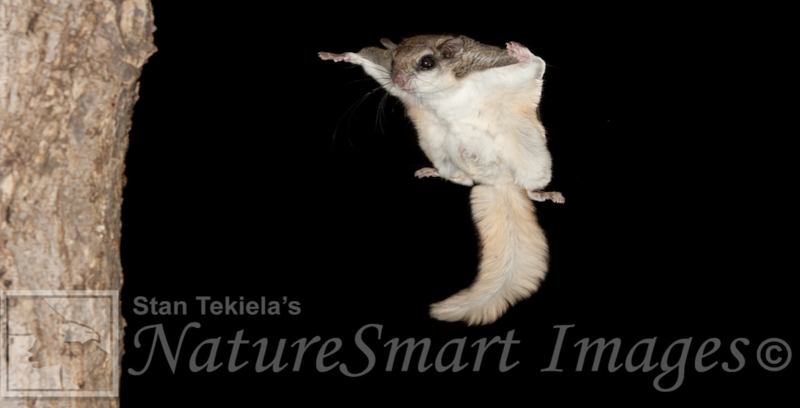 Flying squirrels have long, flat tails, which are very important for steering and stabilization while in flight. The hairs on the tail only grow on the side (distichous) of the tail, giving the tail a flat appearance. Flyers can glide a distance that is at least three times as far as the distance they drop in height. Thus, the higher they start, the longer and farther they glide. While it is very difficult to measure the distances that a wild flying squirrel can glide, some research at Southeast Missouri State University reported maximum glide at around 150 feet. One of the things that makes me smile each and every time I see it is how the squirrels take advantage of their gliding abilities. My squirrels will glide into the base of a large oak tree in my yard to grab a peanut. They will quickly scamper up to the top of this 65-foot tree. They eat the peanut, and then launch themselves off the tree; instead of gliding away to another tree, they plummet straight down, turning at the last second, and land at the base of the tree from which they took off. Every time I see this, I am amazed, and it makes me smile.